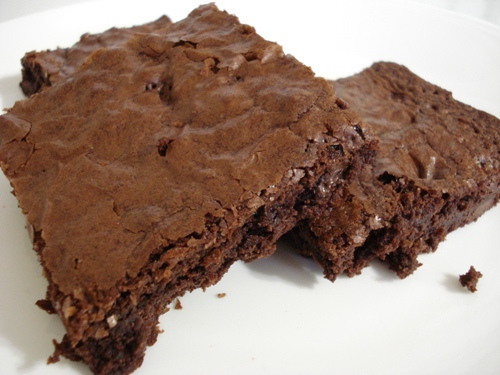 Without further ado, I’ll let you in on my secret: I use a brownie mix. 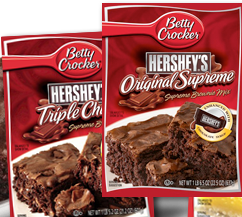 It’s not just any brownie mix, it is Betty Crocker’s. The *other* mixes just won’t do. How good is it? Well, I got a marriage proposal from the Original Supreme version! Right before the pan goes in the oven, I’ll drop in some semi-sweet morsels here and there. For those of you who like precise measurements, I’ll guess maybe 10-12. You don’t want to go overboard (which I’ve done too, LOL), otherwise it won’t come out right. Prep time is about 10 minutes. Baking time around 30 minutes. So if you’re expecting company and want a dessert that’s bound to be a hit (I know it was with everyone who’s ever tried it) or have mad cravings for brownies, keep a box of either the Original Supreme or Triple Chunk on hand. The other ingredients you’ll need are eggs, vegetable oil and water. Easy peezy. One last thing, if you should happen to have vanilla ice cream to serve with these brownies, your guests will love you forever!